I feel like I don't often mention skincare products because I rarely switch up my skincare and I don't often try out new products. Now I'm closer to my mid-twenties my skin has gotten more temperamental and I can't just throw any old nonsense on it without a reaction. I have been using this moisturizer for just under a year now so I feel happy to tell y'all that I'm a big fan. I have heard mixed things about the Origins Make A Difference Plus + Rejuvenating Moisturizer, but for my skin it is great. I have read that this has irritants in it but I actually like to use this when my skin is irritated as I find it really soothing. It goes without saying that what will work on my skin might not work on yours. My skin is prone to dryness as well hormonal cystic acne (which I have found this tends to soothe rather than aggravate). 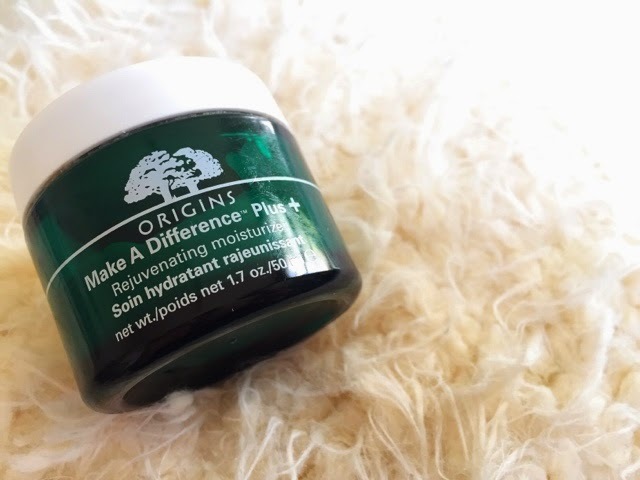 I do also use the Origins GinZing Moisturizer just because I am trying to use that one up - I don't dislike it per say, but I'm definitely not a fan. I find that the Make A Difference Plus + is a lot more hydrating and it helps to plump up really dry, dehydrated skin. I like to use this one in the mornings, especially because it has what I would consider as the typical awakening, citrusy smell that Origins products tend to have (from what I have tried). In terms of the texture of this moisturizer, I would say that it is light and absorbs fairly quickly so it's a great one to apply before foundation. It also doesn't leave any kind of film, which is great because I often find moisturizers that leave films then come off with foundation application and it all gets a bit messy. All-in-all, I really rate this moisturizer because whenever my skin needs that extra boost of hydration or the texture of my skin just isn't at its best, this tends to calm everything down and provide the hydration my skin is craving.